Thank You for Your Service is a 2017 American biographical war drama film written and directed by Jason Hall, in his directorial debut, and based on the 2013 non-fiction book of the same name by David Finkel. Finkel, a Washington Post reporter, wrote about veterans of the 2nd Battalion, 16th Infantry Regiment returning to the vicinity of Fort Riley, Kansas, following a 15-month deployment in Iraq in 2007. The film is about posttraumatic stress disorder (PTSD), depicting U.S. soldiers who try to adjust to civilian life, and stars Miles Teller, Haley Bennett, Beulah Koale, Amy Schumer and Scott Haze. Bruce Springsteen wrote a new song, "Freedom Cadence", specifically for the closing credits. The film had its world premiere at the Heartland Film Festival on October 15, 2017, and was theatrically released in the United States on October 27, 2017, by Universal Pictures. It received generally positive reviews from critics, with praise aimed at the performances (particularly that of Teller, Bennett, and Koale), but grossed just $9 million against its $20 million budget. After a harrowing 15-month combat experience in Iraq, the much-decorated Adam Schumann (Miles Teller) returns home to Kansas and a loving wife, Saskia (Haley Bennett). Adam and Saskia have two young children, a daughter and an infant son born while Adam was still overseas. Adam suffers from PTSD as manifest by nightmares and frequent flashbacks for which his wife convinces him to seek help from an overburdened Department of Veterans Affairs. He also receives solace from two Iraq buddies living nearby, an American Samoan, Solo Aeiti (Beulah Koale), and Billy Waller (Joe Cole), who commits suicide in front of his fiancée (Erin Darke) after discovering she has taken all his money and their child and left him. Adam's unresolved psychological issues revolve around his failure to safely rescue a fellow soldier from a building under fire, Michael Emory (Scott Haze), who was dropped on his head and rendered hemiplegic but later expresses gratitude to Adam for being alive, and survivor's guilt about letting Sergeant First Class James Doster (Brad Beyer) take Adam's place on patrol one day. When the Humvee with Doster filling in for Adam makes a wrong turn and hits an improvised explosive device, Solo assists the men in their escape to safety, but Doster is inadvertently left behind and dies in the conflagration. Doster's grieving widow, Amanda (Amy Schumer), who is best of friends with Saskia Schumann, finally gains closure as she learns the circumstances of her husband's death towards the end of the movie and absolves Adam and Solo of responsibility for it. Meanwhile, Solo suffers from such severe PTSD and memory loss that he is unable to fulfill a fervent desire to reenlist for another tour in Iraq. He falls in with a group of drug dealers led by a Gulf War veteran, Dante (Omar Dorsey). Adam rescues his friend and puts him on a Greyhound bus to California, where Solo will take Adam's reserved place at a rehabilitation center specializing in the treatment of PTSD. Miles Teller as Staff Sergeant Adam Schumann, Saskia's husband, a soldier who leaves Iraq as a broken man. Haley Bennett as Saskia Schumann, Adam's loyal and supportive wife. Beulah Koale as Specialist Tausolo Aieti, Alea's husband, an American Samoan soldier who feels that the military has made his life better. Joe Cole as PFC Billy Waller, a soldier who returns home in crisis and tries to find his fiancée and their daughter, who have left him. Amy Schumer as Amanda Doster, Saskia's best friend and the wife of Sergeant First Class James Doster. Brad Beyer as Sergeant First Class James Doster, Amanda's husband. Scott Haze as Michael Adam Emory, a soldier suffering from PTSD. Sean P Mcgoldrick as Private Chris Kyle Jr.
On March 12, 2013, DreamWorks announced that it had acquired the film rights to David Finkel's then-upcoming non-fiction book Thank You for Your Service, about posttraumatic stress disorder (PTSD) in soldiers who return from the war in Iraq and have difficulties in adapting to civilian life. Steven Spielberg was expected to direct the film, and, in June 2013, American Sniper's Oscar-nominated scribe Jason Dean Hall was hired to adapt the book into a film. Daniel Day-Lewis was later eyed to re-team with Spielberg on the film. On June 30, 2015, The Hollywood Reporter confirmed that screenwriter Hall would instead be making his directorial debut with the film from his own script. Jon Kilik produced the film, which Universal Pictures distributes in the United States. On August 19, 2015, it was reported that Miles Teller was in talks to join the film as Adam Schumann, a soldier who leaves Iraq as a broken man. On October 20, 2015, Haley Bennett was cast to play Schumann's loyal and supportive wife. On December 2, 2015, New Zealand-based newcomer Beulah Koale was cast to play Solo, an American Samoan soldier who feels that the military has made his life better. On January 7, 2016, Scott Haze was added to play a soldier suffering from PTSD. On January 28, 2016, Joe Cole joined the film to play a soldier who returns home in crisis and tries to find his fiancée and their daughter who have left him, while Jayson Warner Smith joined the film to play a receptionist at a Veterans Affairs office. On February 9, 2016, Amy Schumer joined the cast with three others, Keisha Castle-Hughes, Brad Beyer, and Omar Dorsey. It was later revealed that Kate Lyn Sheil had also joined the cast. Principal photography on the film began on February 9, 2016, in Atlanta, Georgia. In March 2016, it filmed at the Gwinnett Place Mall in Duluth, Georgia. The film had its world premiere at the Heartland Film Festival on October 15, 2017, and was theatrically released in the United States on October 27, 2017. On October 20, 2017, Universal and DreamWorks announced a partnership with Chinese-owned AMC Theatres to give more than 10,000 free tickets to the film to veterans and service members. In the United States and Canada, Thank You for Your Service was released alongside Jigsaw and Suburbicon, and was projected to gross around $5 million from 2,054 theaters in its opening weekend. It ended up debuting to $3.7 million, finishing 6th at the box office, and marking the second straight week Teller was featured in a well-received but underperforming biopic, following Only the Brave. In its second weekend it grossed $2.3 million, dropping 40%, and finishing 7th at the box office. On review aggregator Rotten Tomatoes, the film has an approval rating of 77% based on 100 reviews, with an average rating of 6.7/10. The site's critical consensus reads, "Thank You for Your Service takes a sobering and powerfully acted – if necessarily incomplete – look at soldiers grappling with the horrific emotional impact of war." On Metacritic, which assigns a normalized rating to reviews, the film has a weighted average score of 68 out of 100, based on 34 critics, indicating "generally favorable reviews". Audiences polled by CinemaScore gave the film an average grade of "A–" on an A+ to F scale. ^ Kroll, Justin (February 9, 2016). "Amy Schumer to Co-Star in PTSD Drama From 'American Sniper' Writer". Variety. Retrieved October 15, 2016. ^ "Thank You for Your Service". British Board of Film Classification. Retrieved September 19, 2017. ^ a b "Thank You for Your Service (2017)". Box Office Mojo. Retrieved December 2, 2017. ^ "'Thank You for Your Service' Director Talks New Bruce Springsteen Song Featured in Film". Variety. Retrieved February 9, 2018. ^ "Review Roundup: Did Critics Salute THANK YOU FOR YOUR SERVICE?". Broadway World. Retrieved January 2, 2018. ^ Giles, Jeff (October 26, 2017). "Suburbicon is a Stale Satire". Rotten Tomatoes. Retrieved October 29, 2017. ^ a b Sneider, Jeff (August 19, 2015). "Miles Teller in Talks to Star in DreamWorks' PTSD Drama 'Thank You For Your Service' (Exclusive)". TheWrap. Retrieved February 29, 2016. ^ a b c d e f Sneider, Jeff (December 2, 2015). "DreamWorks' PTSD Drama 'Thank You For Your Service' Finds Third Lead (Exclusive)". TheWrap. Retrieved February 29, 2016. ^ a b Kroll, Justin (October 20, 2015). "Haley Bennett in Talks to Star With Miles Teller in 'Thank You for Your Service'". Variety. Retrieved February 29, 2016. ^ a b c d Sneider, Jeff (January 28, 2016). "'Peaky Blinders,' 'Birth of a Nation' Actors Join Miles Teller in 'Thank You For Your Service' (Exclusive)". TheWrap. Retrieved March 1, 2016. ^ a b c d e Fleming Jr, Mike (February 9, 2016). "Amy Schumer Takes Serious Turn In 'Thank You For Your Service;' PTSD Drama By 'American Sniper' Scribe Jason Hall". Deadline. Retrieved March 1, 2016. ^ a b c Sneider, Jeff (January 7, 2016). "'Child of God's' Scott Haze Joins Miles Teller in DreamWorks' PTSD Drama 'Thank You for Your Service' (Exclusive)". TheWrap. Retrieved February 29, 2016. ^ a b Fleming Jr, Mike (March 12, 2013). "DreamWorks Takes On Post Traumatic Stress Disorder, Acquiring Upcoming David Finkel Book 'Thank You For Your Service'". Deadline. Retrieved March 2, 2016. ^ Fleming Jr, Mike (June 4, 2013). "How Jason Hall Went From Struggling Actor To Hot Screenwriter With 'American Sniper' And Two More Big Deals Coming". Deadline. Retrieved March 2, 2016. ^ a b Kit, Borys (June 30, 2015). "'American Sniper' Writer to Direct PTSD Drama 'Thank You for Your Service' for DreamWorks". The Hollywood Reporter. Retrieved March 2, 2016. ^ Jagernauth, Kevin (June 4, 2013). "Steven Spielberg Eyeing Possible Reteam With Daniel Day-Lewis On PTSD War Drama 'Thank You For Your Service'". Indiewire. Retrieved March 2, 2016. ^ Bernardi, Tommy. 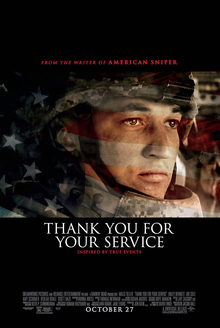 "LSTFI ALUMNI MILES TELLER AND KATE LYN SHEIL SHARE THE SCREEN IN THANK YOU FOR YOUR SERVICE". methodactingstrasberg.com. Retrieved April 3, 2016. ^ "Principal Photography Begins on 'Thank You for Your Service'". Business Wire. February 9, 2016. Retrieved February 29, 2016. ^ "'Thank You For Your Service', starring Miles Teller, filming mall scene in Atlanta today". OLV. March 2, 2016. Retrieved March 8, 2016. ^ "Heartland Film Festival Announces 2017 Lineup, Will Honor Hollywood Legends Rob Reiner and Alan Ladd, Jr. with Lifetime Achievement Awards". Heartland Film Festival. September 15, 2017. Retrieved October 16, 2017. ^ McNary, Dave (March 23, 2017). "Miles Teller's War Drama 'Thank You for Your Service' Gets Awards Season Release". Variety. ^ Universal Pictures(Oct 20, 2017) "UNIVERSAL PICTURES AND AMC THEATRES® OFFER U.S. VETERANS AND ACTIVE-DUTY SERVICEMEMBERS UP TO 10,000 FREE TICKETS TO DREAMWORKS PICTURES' "THANK YOU FOR YOUR SERVICE" PR Newswire. ^ Anthony D'Alessandro (October 25, 2017). "Jigsaw' Looks To Keep 'Saw' Franchise Sharp During Pre-Halloween Weekend With $20M+ Opening". Retrieved October 25, 2017. ^ a b Anthony D'Alessandro. "Horror Has Few Scares At B.O. As 'Jigsaw' Dulls To $16M+, 'Suburbicon' Condemned With D- CinemaScore". Deadline Hollywood. Retrieved October 29, 2017. ^ "Thank You for Your Service (2017)". Rotten Tomatoes. Fandango. Retrieved February 21, 2018. ^ "Thank You for Your Service (2017) Reviews". Metacritic. CBS Interactive Inc. Retrieved October 27, 2017. ^ Seitz, Matt Zoller (October 26, 2017). "Thank You for Your Service Movie Review (2017)". RogerEbert.com. Ebert Digital LLC. Retrieved October 27, 2017.